For ultra convenience, use frozen meatballs. Cook spaghetti according to package directions, omitting salt. Meanwhile, combine ground beef, egg, cheese and bread crumbs in bowl. Divide meat mixture into 14 portions and roll each into a 2- inch ball. Place in shallow baking pan. Bake 10 to 15 minutes or until done (165 degrees F). Place pasta sauce and drained tomatoes in large saucepan; simmer over medium heat 5 minutes or until hot. 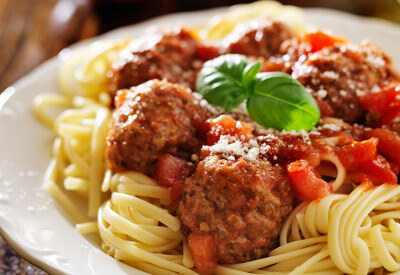 Add hot spaghetti and cooked meatballs to sauce. Toss to coat. Garnish with Parmesan cheese and basil leaves.